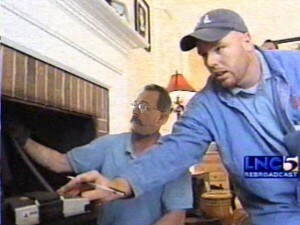 Black Goose Chimney lead technicians are Nationally Certified through the Chimney Safety Institute of America (CSIA). We perform our sweeps to the standards and guidelines outlined in the Successful Chimney Sweeping Manual published by the National Chimney Sweep Guild (NCSG). We take pride in being conscientious of your home and property by protecting it from soot or any other residue while we are performing a sweep on your fireplace and chimney system. Black Goose Chimney offers two levels of inspection in accordance with the National Fire Protection Association (NFPA) standards of inspections. A level I inspection is a limited visual inspection using a light. The level II inspection is a more thorough inspection using a closed circuit camera.